A good friend suggested that I write in English some observations regarding the French presidential electoral campaigns. So far, for obvious reasons, I've referred to French affairs in French, but as modern communication makes the world smaller, and as European nations depend more and more on each other, especially those of the euro zone, what is at stake in France might also be regarded as of European, as well as international concern. That was already the situation in February, 1890. Today, with the additional support of cable and satellite television, and international support of easily accessible Internet, the media wields more power than ever. As the media seem persuaded that most people are similar to sheep, and are easily led to believe what one might wish to write and publish, they have every confidence in their divine power to influence public opinion. We are also blest with periodical popularity and opinion polls, especially during electoral campaigns, the results of which vary suspiciously according to the agency responsible, and seemingly the outcome required. One notes that since Nicholas Sarkozy was elected in 2007, certain media have constantly worked against him, discrediting him and denigrating his considerable efforts and accomplishments during one of the most serious economic crisis in history. One could say that this antisarkozy campaign has been orchestrated systematically in order to promote and program the election of a socialist candidate and government next month. As far as I know, Sarkozy is the first French president to refuse to bend to trade-union pressure. Naturally trade-union power also depends on a pliable government, even at a time when power hungry trade-unions seem increasingly out of clink with the realities of European and world competivity. Recently a Belgian journalist chose to visit France and follow Monsieur Hollande during one of his campaign tours. Naturally she was able to meet Parisian journalists eager in being part of his august retinue. She was sickened by what she heard and saw. It was quite obvious that the press cortège was intent on currying Holland's favour for its own personal gain. The Parisian journalists appeared to have good reason to believe that their efforts to promote Hollande would be generously rewarded. Even I have been censored and accused of 'defamation' for reproving the 'media' concerned (therefore not even alluding to any particular person or journal) for partisanism. One is therefore bound to reach the conclusion that the denigration of Sarkozy and the promotion of Hollande have been energetically programmed by the media. In reality Hollande is a poor substitute for DSK, who, had he not shamefully derailed himself, would have been the first choice as socialist contender for the presidential elections, as everyone knows. What is less known however, is the fact that when François Hollande was the First Secretary of the Socialist Party, he was informed of the Banon case soon after the event. Despite his Party responsibility, and the fact that he then knew how much the PS depended on Strauss Kahn as its Presidential candidate, Hollande chose to do nothing about it. Being aware of DSK's inclinations, had he reminded the ex-patron of the IMF of his responsibilities, and warned him of the dire consequences should he continue to go off track, perhaps history would have been different. One might therefore conclude that François Hollande is also a calculator and an opportunist. His bilan is inglorious. Martine Aubry, the other preliminary socialist contender, publicly labelled him as mou (weak and flabby) Even Mme. Royal, his ex-companion and mother of their four children, is said to have stated that François has done nothing in 30 years. But this isn't exactly true. He is still President of le Conseil Général of Corréze which is classed as the most highly taxed region of France, also due to his continuing to finance Chirac's museum, which was/is running at a catastrophic loss. Perhaps he reasoned that Chirac's support would be useful, for apparently Chirac has stated that he will vote for Hollande. This despite Mme. Chirac's open support for Nicolas Sarkozy. Hollande has never had any ministerial experience. Nevertheless convinced he is going to be elected President of France, he states that he is first and foremost a socialist, which would seem to confirm that as President he would represent first and foremost the socialist contingent of France, and not the French nation as a whole. His ideas are totally unrealistic, isolationist and irresponsible. His plan to 'improve' the French education system, for example, consists of recruiting the schools with 60,000 teachers. Like most socialists, he reasons in numbers. (For some 'Hollandish' reason he seems to favour divisors of 6). Socialist priorities. As if the broth will be improved by so many additional cooks. For it stands to reason that one good teacher in front of a class of 30, would be far more effective, and far less costly, than three mediocre teachers, each responsible for a class of ten. He intends to revert to the 'old' retirement age of 60 years, which is another demagogical and totally irresponsible idea. So eager in his dash to be crowned President of the Republic, he invents new ideas, (like taxing millionaires at the rate of 75%, which is unconstitutional) then he gauges the public reaction to them before either abandoning the projects or modifying them, which is a fair indication of his lack of personal conviction and integrity. Hollande has virtually been fabricated by the media and programmed to win the next elections. He is transparent enough to permit one to see through him, therefore one is aware of his lack of content and consistency. He has even gone as far as to practice and imitate Mitterand's public speech gestures, as the Socialist Party seems to be curiously convinced that the French want to return to the blissful, carefree and illusive era of mythic Mitterandism. Sarkozy has never been appreciated by the media, probably because he is not influenced by them and is therefore unmanipulatable. Hollande, eager to please and be appreciated, has already revealed his weakness in this respect, which might explain the reasons for which certain media have chosen to invest their promotional efforts in him. Ironically the same media have openly criticised him in the past, at a time when it was thought (more reasonably) that he would never be able to contend as a candidate for the presidential elections. For example although Hollande likes to pose as representing the poor (which by extension means that Sarkozy can only represent the rich) he has a number of valuable properties, two of which are alleged to have been absurdly undervalued to avoid paying the legally required amount of property taxes. But it is much easier (and socially permissible) to be a very rich socialist, than a reasonably well-off non-socialist. For the socialists have always claimed the 'monopoly of the heart', even though whenever they have governed there has never been any notable improvement in 'social justice'. After all, let us not forget the priorities of the French socialist party, and the French Trade Unions. Charity begins, and perhaps also ends, at 'home'. If Hollande is elected, he would have had the support of the only Communist party still functioning, and incredibly still popular, in Europe. Le Front de Gauche, Jean-Luc Mélenchon, who appears to believe that France needs a second Revolution. This naturally means that if Hollande is elected President, he would subsequently have to incorporate Communist ideas. (Mélenchon also bellows like another Georges Marchais). The other main candidates are Eva Jolie with the red glasses, who was unfortunate enough to have had a recent fall. She, like most greens, uses environmental problems as rife left wing, political pretexts. Then there's François Bayrou (the dated middle man of Modem) who seems to thrive on every presidential electoral opportunity to express himself on TV, and criticise Presidents' performances. But he is always careful to avoid any real commitment, such as ever accepting a ministerial post. Marine Le Pen, is brandishing her father's faded Front National flag. After emphasising the real danger of extremism in France, she now criticises Sarkozy for immediately and successfully doing something about it, following the atrocious Mehra affair. Unsurprisingly most of the candidates are not really in the running. Incredibly however, Jean-Luc Mélenchon is. In a Europe where direct competivity is the most determining factor, especially in the euro zone, taking France backwards to such isolationist, dated ideas would clearly be catastrophic. But so far, the fabrication and programming of Hollande by the media appear to have paid off. Even the relatively intelligent seem to be persuaded to vote for Hollande, whilst for some unaccountable reason, (apart from five years of left-wing media antisarkozy hammering) and in spite of all that the President has accomplished, Sarkozy is labelled as being detested. One might reason that the French like changes, to such an extent that they are more inclined to risk the unknown or the dodgy, than stay with a strong, reliable bet. But in this particular case, when Europe is still suffering from the throes of one of the worst financial crisis in history, there's far too much to lose. Hollande is simply not strong enough and not qualified. He is, as one says here, a Tartuffe. An impostor. In today's Europe, one can no longer simply rob the rich in order to pay the poor. It doesn't work any more, and perhaps it never has, at least not since Robin Hood. The over-taxed rich simply go elsewhere, and then a nation loses out completely. The only serious and responsible way to be able to finance social welfare and public functions is through reasonable public taxation, and by encouraging then allowing enterprises and businesses to innovate and flourish. The French are capable of producing excellent automobiles, for example, but since 2007, the beginning of the crisis, there seems to have been less innovation, at least regarding petrol driven and hybrid vehicles, than elsewhere. French automobile companies have invested their efforts, perhaps a little too soon, in electronic powered vehicles, whereas Italy has successfully revamped the Fiat 500, and fairly successfully their Alfa Romeo series. Germany (BMW) has had great success revamping the Mini Cooper in time for the Mini's 2009 anniversary. Recently they have had even greater success with their new Volkswagen series. Therefore direct competition, especially in the euro zone, seems to be in its determining stage. Perhaps the strongest and most successful will eventually be 'European', through mergers etc., similar to the mergers of international publishers. In the meantime concurrence is the criterion. The word competivity, doesn't seem to figure in the socialist vocabulary. It's a word that creates uneasiness in the socialist (and communist) ranks. The socialists still like to believe in the mythic mensonge of 'equality'. They refuse to believe that 'equality' is in fact abnormal or unnatural. In their bid to bring about equality, (égalité) they will do away with ideas such as rewarding young scholars for good work. In their view it creates 'politically incorrect competivity'. For the sake of mythic equality they will discourage the talented to forge ahead, in order to allow the less talented the chance, in principle, of catching up with them. Naturally the consequence of such absurd ideology is that the level of education is systematically pulled down. It goes without saying that mythic 'equality' can never be fabricated by inverting the process. Socialists would never risk pressurising the less capable to invest the necessary time and effort to equal the more capable. This dogma is all the more incoherent when the young, newly formed, would-be egalitarians eventually leave school ill-prepared to contend with the real world where competition, for very obvious reasons, reigns. As the French sometimes have to go through the motions, as though they have a sort of fatal tendency determining that history must repeat itself, France would have to exercise great patience and philosophy should Hollande finally succeed in getting elected. Once again the French would be obliged to learn the hard way, and realise that trying to go back in time isn't the most inspired and opportune idea during a financial crisis, and a period of international instability and insecurity. The only consolation, should French voters be so inclined, would be the likelihood that Hollande would turn out to be the complete disaster that logic would anticipate, and that his reign would be as brief as possible. 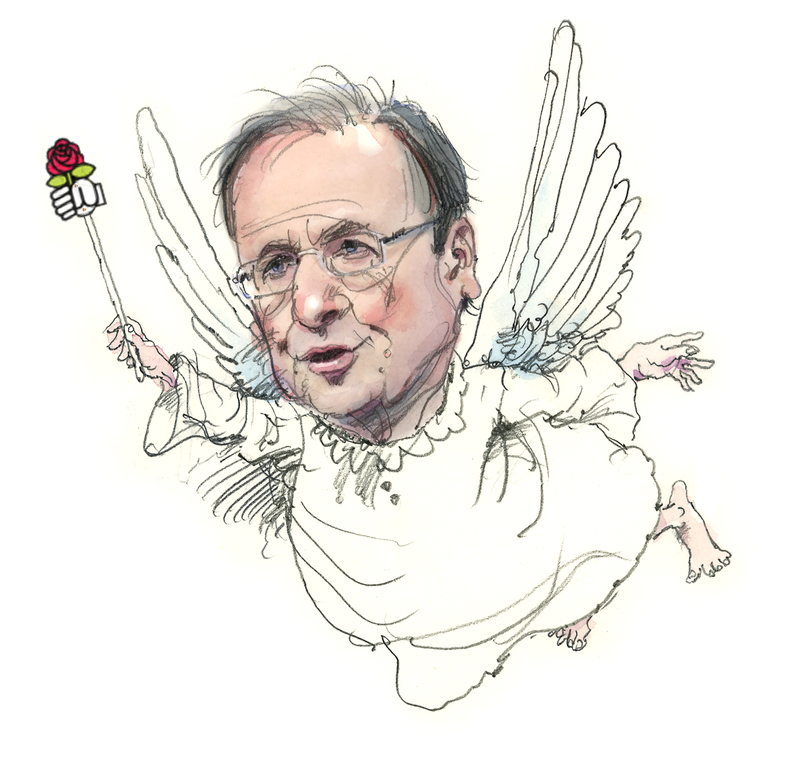 Unless there be a more fabulous consolation, and once elected Hollande turns out to be a Fairy Godfather truly capable of performing miracles. But somehow that hardly seems likely, so let's hope and pray that reason will finally prevail, before it's too late. Un après note pour les lecteurs français. En considération du fait qu'un peu plus de la moitié des français ont voté pour F. Hollande, et qu'avant les élections l'enthousiasme de certains de ces partisans était tel qu'ils ne se sont jamais retenus à exprimer leurs opinions en sa faveur (ou plutôt contre N. Sarkozy) et parfois de manière assez agressive, il me semble ironique que depuis l'élection de Hollande personne ne le défende contre les observations et les opinions comme les miennes, par exemple. Comme un des objectifs originaux de Viewfinder était justement de 'chercher' ou inciter des points de vus divers et constructifs pour contrer de manière intéressante de tels arguments, doit on conclure que le manque de réaction indique un tacite accord général à ces arguments? Perhaps she would like to think so, but in reality, should the worst be realised and Hollande is elected, because of the Mélenchon support, the results are bound to be hard left and very much in reverse..
Il y a plus prolétaire que le prolétaire. Il y a la femme du prolétaire. Eva Joly now has a pair of green glasses, or maybe her red ones change colour according to the current political tendency and circumstances. It's apparent that she hasn't yet realised how catastrophic her presidential candidature situation is, by a very condescending remark she made today: Nicolas Hulot ne représente que sa fondation. (Nicolas Hulot only represents his foundation). But Eva Joly doesn't represent anything, and least of all ecological interests. In this respect she is very badly placed to try to demean Nicolas Hulot, and anyone else, for that matter. Maintenant (28 avril) il y a même Strauss Kahn qui se joint à la meute pour essayer de mettre en miettes Sarkozy, mais il se trompe piètrement de cible. Pourquoi donc a t-il tant attendu avant de faire une telle accusation bidon? Pour voir d'abord qui, selon lui, a la meilleure chance de gagner les élections? Pourquoi Sarkozy aurait-il recommandé DSK pour le poste de directeur du FMI s'il avait l'intention plus tard de le faire couler? C'est totalement absurde. Insinuer, voire accuser le gouvernement d'un coup aussi tordu, et au tout dernier moment des élections, est lamentablement honteux, comme s'il avait le droit de trouver un bouc émissaire pour ses propres actes dépravés. Croit-il qu'il sera accueilli au sein du club socio-communiste pour son petit appui pitoyable de goût pourri en leur faveur? Si complot il y en a eu, il aurait été bien mieux planifié que cela, et si finalement Strauss Kahn, tout en étant bien conscient de sa propre importance pour les présidentielles, avait le moindre de doute de la possibilité d'un coup monté contre lui, pourquoi est-il tombé si bêtement dans un tel piège prétendu? Au lieu d'essayer de profiter de la situation actuelle de manière aussi odieuse et incohérente, n'aurait-il pas fait mieux de réfléchir davantage et regarder dans son propre camp? Car c'est plutôt là où se trouve la faille. D'ailleurs il y a danger que son accusation ne rebondisse rudement en pleine figure de Hollande. Pourquoi après l'affaire Banon dont le Premier Secrétaire était bien informé, Hollande n'a rien dit et n'a rien fait? Pour aider Strauss Kahn? Pourquoi Hollande a préféré le silence au lieu de rappeler à Strauss Kahn ses responsabilités en le mettant en garde justement pour éviter de telles possibilités à l'avenir? Ne peut-on pas traiter ce silence déjà comme une trahison, sinon un complot? Pourquoi le candidat remplaçant a-t-il déclaré qu'il s'est préparé pour les présidentielles depuis longtemps quand il savait pertinemment que Strauss Kahn était bien le favori comme candidat des présidentielles du parti socialiste? Cette insinuation tardive de la part de Strauss Kahn rend même pire son cas, et risque d'être un cadeau bien infect pour Hollande et de ses acolytes. Suite au dernier commentaire, on est informé ce matin (LCI) que l'entourage de Strauss Kahn affirme que ce dernier n'a pas eu aucune entrevue avec The Guardian. Décidément tous moyens sont bons pour essayer de faire tomber le Président, mais il y a toujours un risque que de telles méthodes vont retourner contre le camp qui les applique.